A lot has progressed since the release of Discord 2 years ago, including it's API! As of today, you can write applications through their developer portal . The great thing about is that you can use many opensource APIs, in many different languages to write your app. I'll be showing you a very simple "Hello <user>!" callback I made with discord.js . I just want to make clear that this post isn't about me teaching you how to code - there are hundreds of videos and tutorials on how to start. 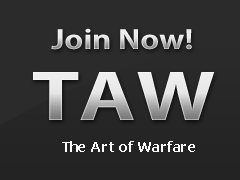 However, with the word going round that TAW might be getting a Discord server here's to show that is isn't hard at all to and/or understand code, while at the same time showing you old chumps the potential of Discord's APIs. But, most of all it is to interest you in coding! The best way to learn it is to code it. Reading books about it won't help, you need hands on experience and you need to fail. A lot. Write code > compile > fail. 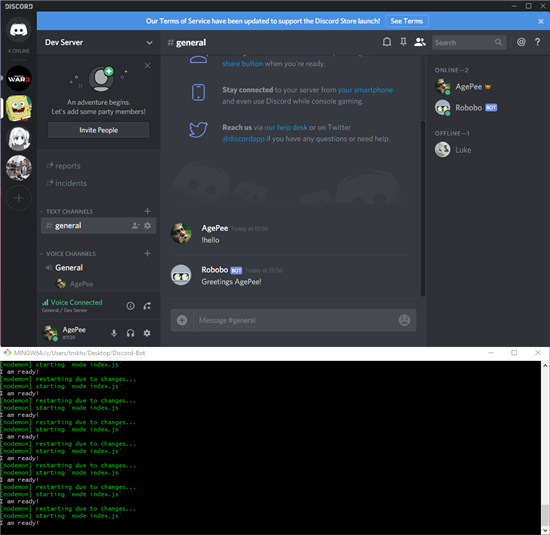 Maybe making a Discord bot is a good starting project? Start by learning the basics at w3school untill you can read and understand the code I've posted down below, then I recommend rewatching the tutorial video from the beginning and pogressing through the video guides onto more difficult jobs the Bot can do (f.y.i. , the sky is the limit). Although I do recommend to do some work outside Bot programming, such as sorting your music folder by alphabet using the quicksort algorithm, then Tim-sort etc. Knowledge of algorithms and complexity is also key to any programmer. Our field of study is called 'Computer Science' after all. Yeah maths! You'll see many similarities with my code and that in the video. Heck they're 1-on-1 if you ask me. I haven't listed any screenshot of botconfig.json because of it; the code is the same except for my personal, secret token. If you have hold of my token, you can launch my bot from your home. That's not what I want, do I? Also, the format of the botconfig file isn't JavaScipt - it's JSON! I recommend you read up on what it is and when you use it. Again, w3school is your friend! 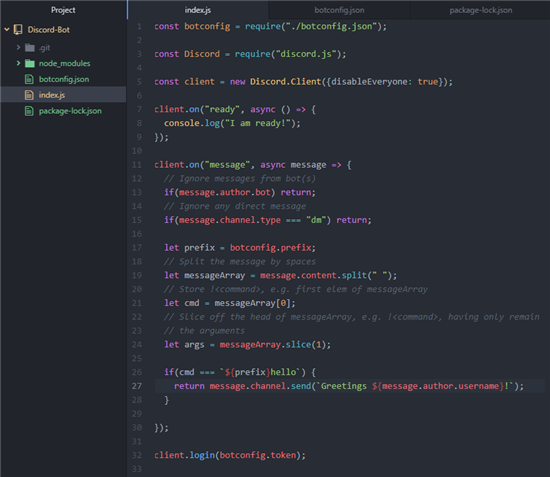 The very bottom shows that I'm using nodemon in my terminal. I recommend, after you've watched the video and installed Node.js , to install it afterwards. Basically it restarts your server whenever it detects a save in the code it's running from. You just press CTRL+S, and the server restarts itself in the background. Nicee.. but don't worry, the setup is included later on the guides of the video series. Now, I sparked your interest. Start coding! Music Bots, RPG Bots, integrate it with your website (Trecky plox I know you read this), link Elon Musk's twitter feed so you're up to date when he launches anime into space. You go champ!